In IBP Excel Add-In (latest version 1711) I tried to format the rows containing the totals and would like to ask politely for your help/suggestions. Please share the EPM Formatting sheet and the dimension (Member) you tried to format. Also what kind of formatting information would help to analyse the reason for not picking up the formats. I don't know which Dimension/Member I should use to address the different Total Rows on different levels. I tried to apply a Background Colour for the different Total Rows and change the background color differently. 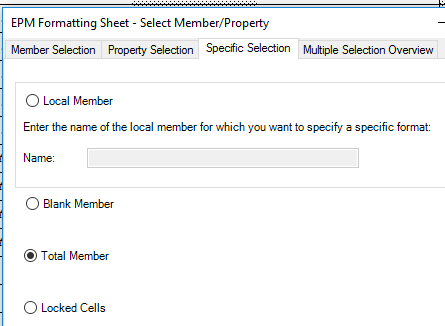 Normally, I would open the Formatting Sheet, click on 'Add Member/Properts', change to 'specific Selection' and select the Total Member. Then apply Formatting via the Table Colums 'Data' and 'Use'. But how to adress different Total-Levels (here: Prod Des-ShipTo-Loc-ShipFrom is one level and Loc-ShipFrom is another level). In release 1711, there's a new functionality called Totals in the Planning View. You can add totals directly to the Attributes of the planning - see screenshots 'edit-planning-view.png' and 'planning-view.png'. You may find additional information in our SAP Help Portal Totals in the Planning View and our Model Configuration Guide Global Configuration Parameters. Thank you for your reply, Matheus. Please see my answer from above. In EPM there is an option for hierarchy setup. You have to check hierarchy level formatting and then color Data cell under different levels in the Rows section. Other applications in EPM can identify the hierarchy but not in IBP. So in IBP we are left with the option of VBA for coloring it. Saying that doing it through VBA is very easy and I could achieve it. What kind of formatting do you want to apply to the Total rows? Someone found a solution for my problem?